Non-fumeur, rez-de-chaussée, condo de 2 salles de bain. Idéal pour 2 adultes et 2 enfants. Entièrement rénové avec des finitions haut de gamme. Toutes les commodités: AC, TVHD, WIFI gratuit, appels américains et canadiens gratuits, appareils électroménagers en acier inoxydable, comptoirs en granit. Situé dans la partie supérieure du village d'Ekahi, une communauté située au bord de l'océan, sur la plage de Keawakapu, à Wailea, dans le sud de Maui. NOTE: RÉNOVATION DU PAVILLON EKAHI 4/22 - 15/12/2019 --------------------------- Le pavillon Ekahi près de la plage sera en cours de rénovation du 22/04 au 15/12/2019. L'accès à la piscine principale et à la plage restera ouvert pendant cette période, avec des toilettes portables haut de gamme fournies. Les trois plus petites piscines d'Ekahi seront disponibles pendant la rénovation. Vivez vos vacances de rêve pour une escapade romantique ou des vacances en famille. Les propriétaires travaillent directement avec vous pour votre expérience parfaite à Maui (voir nos commentaires). 5 minutes à pied de la plage à travers un aménagement paysager luxuriant. 3 piscines, belle plage, idéal pour nager, plonger en apnée, boogie board et se détendre. Près de la promenade de la plage de Wailea, des boutiques de Wailea, du tennis / golf de Wailea et de Kihei. This is our second 28 day stay in Stephan’s condo. We love the Ekahi Village resort and this condo is one of the best values for a fully renovated unit. The master king bed and the living room queen Murphy bed are both very comfortable and allow room for four. The kitchen is complete with all the essentials you need to cook, which we did most nights, as well as a large Weber bbq. The location is near the top end of the resort, near the quiet pool #3, and about a 5-8 minute walk to the beach. Since the lanai backs on to Okalani Road, there is some traffic noise on the lanai, but with the windows closed and the central A/C on, it is quiet. The bedroom is at the back of the condo away from the road and is very quiet for a good night’s sleep. A similar unit in the interior of the resort will cost $50+ more. Excellent location and condo with lovely grounds and on the same beach as high end resorts. We ended up driving to the beach instead of walking with our toddler which was a little disappointing as we had hoped it was a bit closer to the water. Other than that this was a wonderful place to stay and we really appreciated the beach gear there. Parking was easy, building was quiet. Linens could use updating but for the price, location, simple checkin and updated appliances this was a very enjoyable place to stay on our vacation. 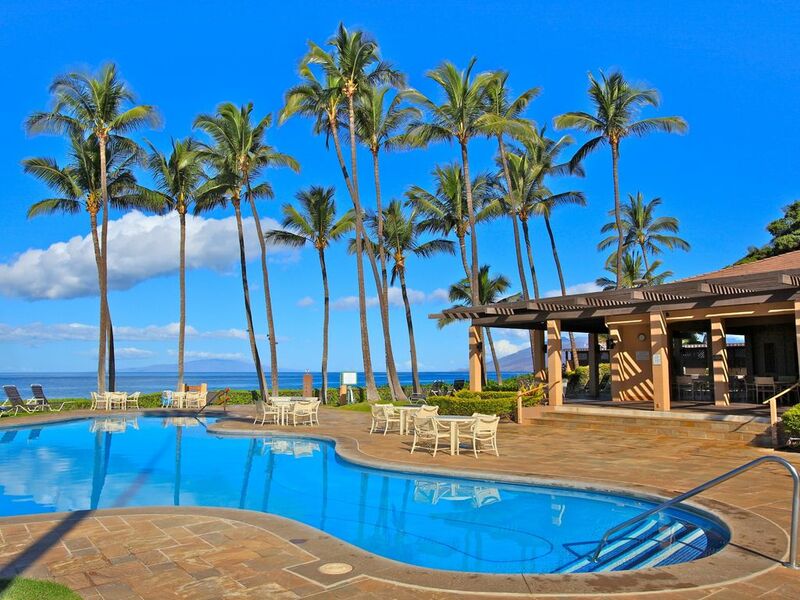 We chose the Ekahi Condo community for our vacation stay because of a family recommendation. The grounds were beautiful and well kept. Our condo was very nicely laid out and the kitchen was great! We were disappointed by the road noise near the lanai so we didn’t use the space and there was no ocean view. The linens in the unit could use an update, but the bed was comfortable and the bathrooms were great. I would recommend Ekahi condos to others visiting Maui as it’s a great location a bit separated form the bustle of Kihei. Beautiful beachs and lovely swimming pools. The property was exactly as advertised and had everything we could have needed! The property was beautiful and a short walk to a perfect little beach with great snorkeling right off shore. The condo was well stocked with everything we could have needed. There was easy access to the freeway to get all around the island, but Wailea was a quiet break from the busyness of the rest of the island. We would definitely book this condo again! Condo was clean and had everything we needed for our stay. The road noise off the patio was a little noisy, but never a problem when trying to sleep. The beds were very comfortable. The kitchen was well stocked with all the tools needed to prepare meals. Plenty of toys-boogie boards, snorkeling gear, sand toys, noodles. Beach gear-chairs, umbrella, grass mats, beach towels. The pools are great- a quiet place to read, lay in the sun or shade, or float in the water. The walk to the beach is wonderful. The beach is so much fun! At low tide, it is great to float around in the water or go snorkeling and hang out with the turtles. At high tide, the waves are perfect for some boogie boarding. The beach never got crowded, there were times there were only a few people. Ekahi Village is a safe and quiet community. Superlatives , words, pictures really don’t do justice to such a wonderful place. It truly is a little bit of paradise. The condo itself is right sized. Perfect for two, manageable for four. It’s kept up nicely and well maintained. Walk though gardens, a short stroll to the beach. A short car ride to town. It never seemed busy and we were there the first two weeks of summer. It’s the sort of place one imagines they can go back annually, a home away from home. It has a million dollar view, for a well priced holiday stay. This condo, location, by any measurement, is number Ekahi! Mahalo.